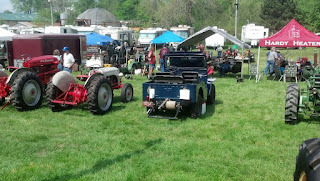 There is Blue, in the middle of a row of fine antique tractors! 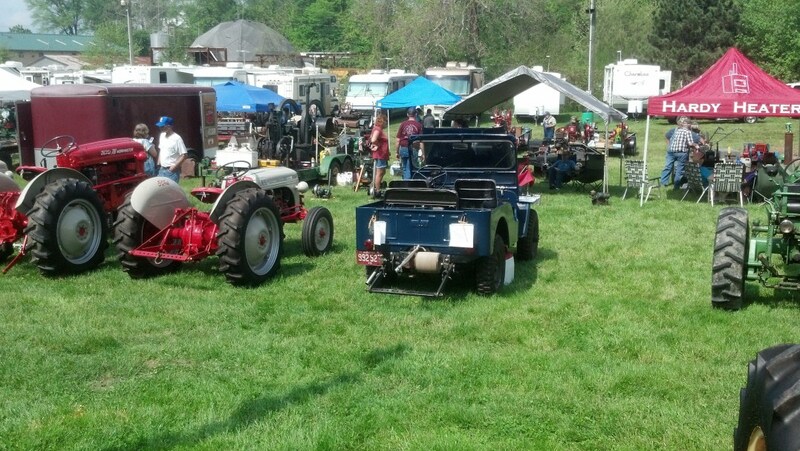 After years of saying we were going to take the jeep to a tractor show, we finally did it. Following up on our last post, Thursday was final preparation day. 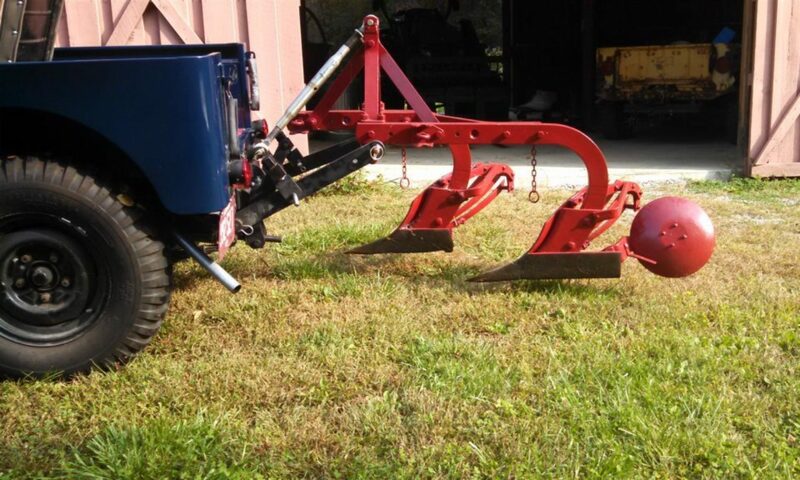 The hydraulic pump was bolted on the mount in front of the crankshaft pulley, but not connected and the 265 lb front bumper weight installed (with the help of the engine hoist). Finally, we gave Blue a quick bath to get the dust off. One goal of Farm Jeep has been to collect and share information and stories about jeeps being used on the farm. 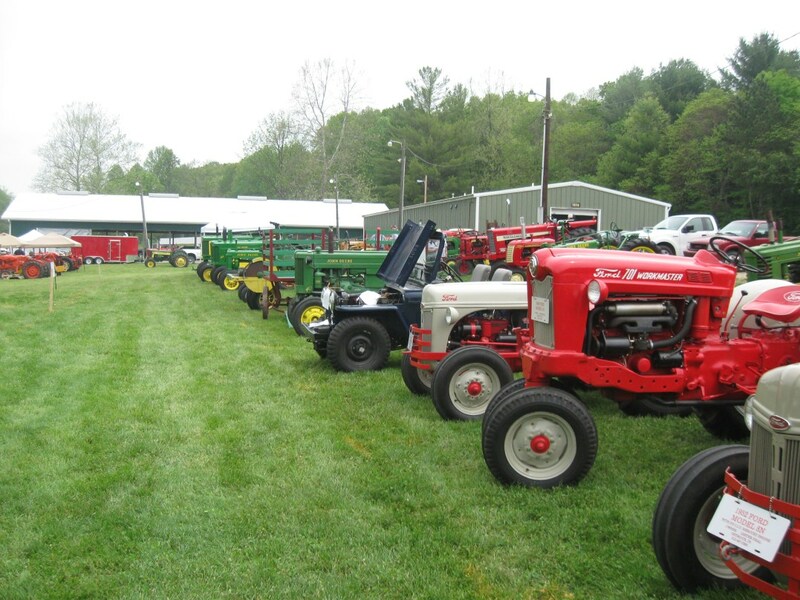 At most shows, tractors are lined up and each exhibitor determines what, if any, information to provide. Most provide signs with the owner’s information and the date the tractor was built but very few provide additional details. 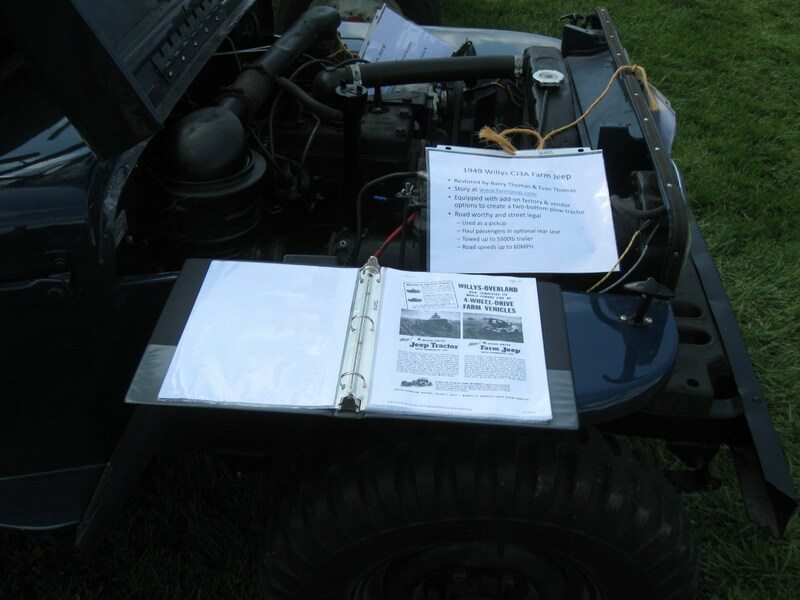 Believing few people would have seen a farm jeep, Barry resorted to pre-retirement skills and created a short paper-based PowerPoint presentation to accompany Blue. It had been the plan to drive Blue to the Brown County show, since we can get there on back roads, with only a short stretch of busy highway. But between the valve and clutch noises, we felt it best to give Blue a ride on a trailer. So early Friday Barry picked up the rental trailer and loaded up Blue for the 30 minute trip. It was an easy drive and Barry was soon standing in front of the registration desk asking where he could park Blue. He explained it was equipped as a tractor and didn’t want to exhibit it in the old trucks and cars section. After a couple of phone calls, he was told to park at the end of a line of John Deere tractors. Along with the PowerPoint slides, Barry had 3 old ads mounted in picture frames to help tell the story. After watching people’s interest, he determined that a better plan was a loose-leaf notebook with copies of ads from the Web site would be a better idea. The combination worked very well for the second and third days. We were the best documented tractor and it was really appreciated by the many visitors stopping by. People seeing the jeep fell into 3 main groups; those who had never heard of a jeep “tractor”, those who had heard, but never seen and then a very few who had used a jeep on the farm or had neighbors or friends who had farm jeeps. This latter group provide to be the most fun, and it was clear Blue brought back some great memories. There was a large group of “I’m sorry I sold my jeep and I sure wish I still had it” visitors who also told stories. There were several vets who wanted to talk about their military jeep adventures and a WWII vet recalling his days in the muddy fields of Europe. It is unfortunate that we didn’t have a way to record some of the stories. 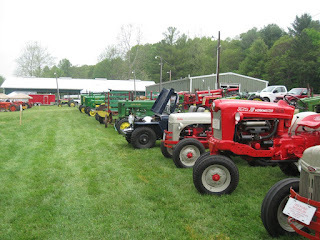 Friday and Saturday were extremely busy, but by Sunday noon, most of the tractors had been loaded up for home. We stayed until after lunch, then loaded up for a quick trip home. It was great fun and we anticipate doing more shows in the area. Next year will will drive Blue to this one.
! It’s like you understand my mind! You seem to know a lot about this, like you wrote the book in it or something. I think that you could do with some images to drive the message home a bit, but other than that, this is wonderful blog. A good read. I’ll certainly be back. Previous PostPrevious All Dressed Up and Someplace To Go!